What are the current analytical challenges associated with the pharmaceutical industry? I think the most pronounced challenge we are facing now is R&D efficiency. With analytical chemistry, we aim to obtain high quality data that will enable decisions to be made quickly, which is very important, especially for the new landscape of drug discovery and drug delivery technologies. It is not only about the amount of data generated, but also about obtaining meaningful, high quality data that can immediately enable decision making and that is still a challenge. For example, in a pharmaceutical setting, characterizing a sample involves many technologies and methods, which can be very time consuming, tedious and inefficient. On top of that, there is also method development, which takes time - developing a method often takes much longer time than the testing itself. What is multidimensional liquid chromatography and how is it beneficial over one-dimensional chromatography? As the name suggests, multidimensional liquid chromatography (MDLC) involves more than one dimension. 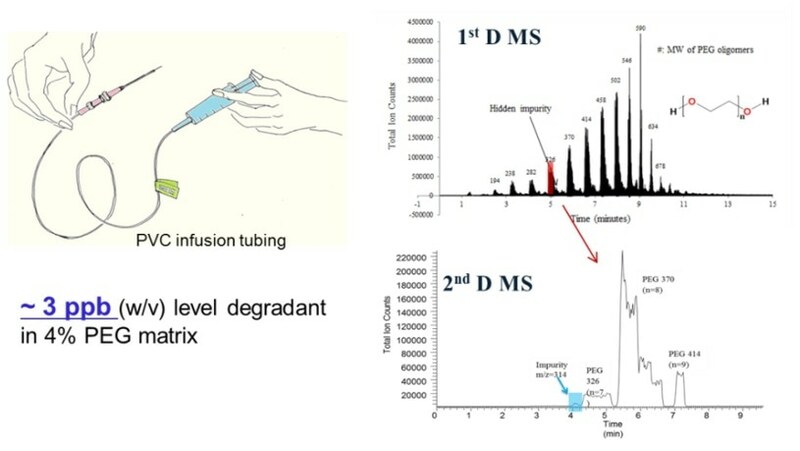 Simply put, typically, one-dimensional liquid chromatography uses one column to separate the sample; whereas MDLC uses multiple columns, and the sample or portion of the sample is subject to more than one separation medium. The benefit of MDLC is the higher separation power. It is not only very helpful for complex samples, but also for less complex samples, where the separating of coelutions and the capture of every individual component in a sample is critical for quality and safety concerns, such as materials used for clinical studies. How has the use of MDLC evolved in the pharmaceutical industry? In the past, MDLC was mainly used as a research tool. People would use their own homemade versions of 2DLC or MDLC, mainly for their research interests and it was not a mainstream tool. In recent years, there has been a big increase in the use of 2DLC in pharmaceutical and biotech applications. This is largely due to the commercialization of the 2DLC instruments and also to researchers from academics looking at how to improve the technology and demonstrating the benefit of using it, and the drive from industry to solve real-world problems. Now, there are many more applications in the pharmaceutical industry, compared to five years ago and there is an increase in this trend. We have been using MDLC routinely to support our pipeline since a few years ago. What makes a multidimensional approach well suited to pharmaceutical quality control testing? Pharmaceutical samples contain a variety of components and potential impurities, such as active drug ingredients, counter ions, excipients, potential stereo isomers, by-products, degradants, extractables and leachables, etc. These components and impurities have a wide variety of physiochemical properties, so one separation mechanism or one column is hard to separate them all, which challenges the quality control purpose. 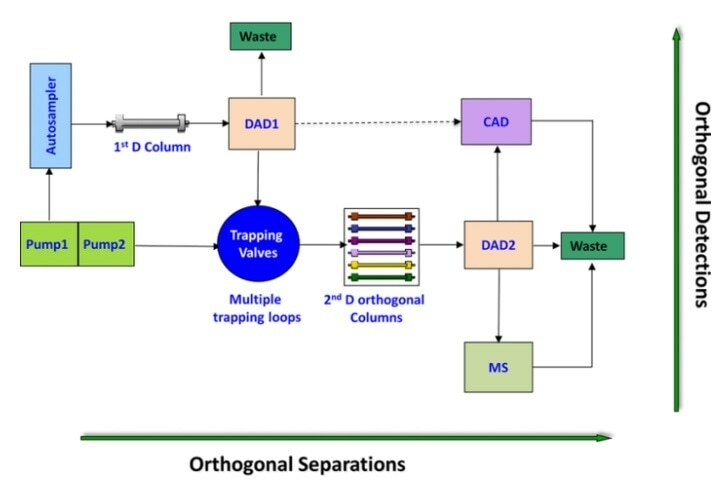 Whereas, multidimensional separation offers different separation mechanisms or multiple separation mediums in one sample analysis, which can potentially capture all of these components and impurities. What technologies are currently used for quality control in pharma? HPLC is the workhorse for quality control in pharma. The one-dimensional HPLC is still the mainstream tool. The coming years will see more 2DLC or MDLC in this area, but just like with every new technology in the regulated environment, it takes time. My talk at Pittcon 2019 will be about some of our recent development and applications of MDLC for the analysis and characterization of pharmaceutical samples. In addition to the typical applications based on the high peak capacity and orthogonality of 2DLC, we have come up with new strategies to use it that allowed us to significantly increase analytical efficiency. In my talk, I will focus more on new strategies to the ones people traditionally use with 2DLC. This new approach enables us to quickly obtain multiple quality attributes in one sample analysis, without tedious compound specific method development. We have been successfully applying this over the past two years to our quality control of materials used for toxicity study. How do you think MDLC will transform the pharmaceutical industry? I think MDLC is a game changer that will transform the pharmaceutical industry on certain practices. There are more benefits that MDLC can bring to the table of biopharma R&D than people have realized. As we talked at the beginning that R&D efficiency is one of the major challenges we are facing, MDLC is one of the tools that can help us to significantly increase our analytical efficiency. Although it takes time to reach to the status that people are fully benefited from using MDLC routinely, with the current trend of collaborations between instrument vendors, academics, and those in pharma and biotech to move this technology forward, I am pretty hopeful and optimistic that it is coming and won’t take too long. 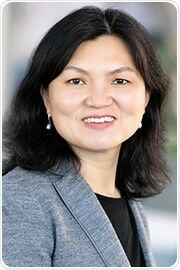 Dr Kelly Zhang is a Principal Scientist at Genentech in South San Francisco, California. She leads analytical chemistry R&D teams for drug substance and drug formulation, moving novel therapeutic molecules from research to clinical trials through collaboration with cross-disciplinary teams. Her current research interests are multi-dimensional separation, universal detection, high throughput automation and pharmaceutical characterization. She was named one of the top 50 most influential women in analytical science by The Analytical Scientist. She is a member of the Permanent Scientific Committee of the international HPLC conference series.